View of the Mariinsky Theatre in the 1890s. The Mariinsky Theater (Russian: Мариинский театр, also spelled Maryinsky Theater) is a historic theater of opera and ballet in St Petersburg, Russia. Opened in 1860, it became the preeminent music theater of late nineteenth–century Russia, where many of the stage masterpieces of Tchaikovsky, Mussorgsky, and Rimsky-Korsakov received their premieres. Since Yuri Temirkanov's retirement in 1988, the conductor Valery Gergiev has served as its general director. The theatre is named after Empress Maria Alexandrovna, wife of Tsar Alexander II. The theater building is commonly called the Mariinsky Theater. The companies that operate within it have for the purposes of brand recognition retained the famous Kirov name, which was given to the building during the Soviet era to commemorate the assassinated Leningrad Communist Party leader, Sergei Kirov (1886-1934). The Imperial opera and ballet theater in St Petersburg was established in 1783 at the behest of Empress Catherine the Great, although an Italian ballet troupe had performed at the Russian court since the early eighteenth century. Originally, the ballet and opera performances were given in the wooden Karl Knipper Theater on Tsaritsa Meadow, near the present-day Tripartite Bridge (also known as the Little Theater or Малый Театр in Russian). The Hermitage Theater, next door to the Winter Palace, was used to host performances for an elite audience of aristocratic guests invited by the Empress. A permanent theater building for the new company of opera and ballet artists was designed by Antonio Rinaldi and opened in 1783. Known as the Imperial Bolshoi Kamenny Theater, the structure was situated on Theater Square. Both names were coined to distinguish it from the wooden Little Theater: "Kamenny" (Каменный) is the Russian adjectival form for "stone" and "Bolshoi" (Болшьой) is the Russian word for "big." In 1836, the Bolshoi Kamenny Theater was renovated to a design by Albert Cavos (son of Caterino Cavos, an opera composer), and served as the principal theater of the Imperial Ballet and opera. On January 29, 1849, the Equestrian circus (Конный цирк) opened on Theater Square. This was also the work of the architect Cavos. The building was designed to double as a theater. It was a wooden structure in the then-fashionable neo-Byzantine style. Ten years later, when this circus burnt down, Cavos rebuilt it as an opera and ballet house with the largest stage in the world. With a seating capacity of 1,625 and a U-shaped Italian-style auditorium, the theater opened on October 2, 1860 with a performance of A Life for the Tsar. The new theater was named Mariinsky after its royal patroness, Empress Maria Alexandrovna. The Imperial Mariinsky Theater and its predecessor, the Bolshoi Kamenny Theater, hosted the premieres of all the operas of Mikhail Glinka, Modest Mussorgsky, and Pyotr Ilyich Tchaikovsky. At the behest of the theater director Ivan Vsevolozhsky, both the Imperial Ballet and the Imperial Opera were relocated to the Mariinksy Theater in 1886, as the Bolshoi Kamenny Theater was considered unsafe. It was there that the renowned choreographer Marius Petipa presented many of his masterpieces. The first original ballet to be produced there was Petipa's The Magic Pills, to the music of Léon Minkus. Petipa's productions included such staples of the ballet repertory as Tchaikovsky's The Sleeping Beauty in 1890, The Nutcracker in 1892, Raymonda in 1898, and the definitive revival of Swan Lake (with Lev Ivanov) in 1895. Other notable Petipa productions included revisions of Giselle, Le Corsaire and the original ballets Raymonda, La Bayadere, Don Quixote, and Harlequinade. World premieres of Mussorgsky's Boris Godunov, Rimsky-Korsakov's The Golden Cockerel, Tchaikovsky's The Queen of Spades and Iolanthe, Prokofiev's Romeo and Juliet and Cinderella, and Khachaturian's Spartacus were also produced there. Among the twentieth-century ballets, Spartacus was inaugurated there in 1956. Carlotta Brianza and Paul Gerdt of the Imperial Ballet as Princess Aurora and Prince Desire in the 1890 premiere of the Sleeping Beauty. The Mariinsky Ballet, affiliated with the Mariinsky Theater is one of the most famous ballet companies in history. The company was known as the Imperial Ballet until the early twentieth century. Following the assassination of Sergei Kirov, it was renamed Kirov Ballet but reverted to the original name after the fall of Communism. The imperial and Soviet theater was the home of numerous great impresarios, conductors, and musicians. Following the October Revolution of 1917, the ballet master Agrippina Vaganova determined to continue the traditions and methods of the Russian Imperial Ballet. Her method laid the groundwork for the formation and development of classical ballet in the world. The Vaganova Academy of Russia Ballet, the ballet school of the Mariinksy Theater, spawned careers of Mathilde Kschessinskaya, Olga Preobrajenskaya, Anna Pavlova, Tamara Karsavina, Vaslav Nijinsky, Marina Semenova, George Balanchine, Galina Ulanova, Rudolf Nureyev, Natalia Makarova, Mikhail Baryshnikov, Irina Kolpakova, Altynai Asylmuratova, and in more recent tines dancers of renown like Diana Vishneva, and Svetlana Zakharova. During the Cold War, however, the company faced the problem of some dancers refusing to return from Western countries they toured, while others were transferred by Soviet authorities to the Bolshoi Theater in Moscow. In this way the company lost great dancers, such as Ulanova, Semenova, Nureyev, Makarova, and Baryshnikov. Under Yuri Temirkanov, Principal Conductor from 1976 to 1988, the Opera Company continued to stage innovative productions of both modern and classic Russian operas. However, since 1988, under the artistic leadership of Valery Gergiev, the Opera Company has entered a new era of artistic excellence and creativity. Although functioning separately from the Theater’s Ballet Company, both Opera and Ballet Companies are headed by Gergiev as Artistic Director of the entire Theater. His tenure as head of the present day Opera Company at the Mariinsky Theatre began in 1988 and (especially since 1993), Gergiev’s impact on opera there has been enormous. Firstly, he reorganized the company’s operations and established links with many of the world's great opera houses, including the Royal Opera House, Covent Garden, the Metropolitan Opera, the Opéra Bastille, La Scala, La Fenice, the Tel Aviv Opera, the Washington National Opera and the San Francisco Opera. Today, the Opera Company regularly tours to most of these cities. Gergiev has also been innovative as far as Russian opera is concerned: in 1989 there was an all-Mussorgsky festival featuring the composer’s entire operatic output. Similarly, many of Prokofiev’s operas were presented from the late 1990s. 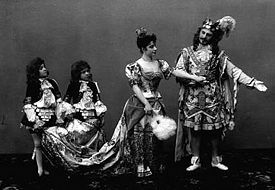 Operas by non-Russian composers began to be performed in their original languages, which helped the Opera Company to incorporate world trends. The annual international Stars of the White Nights Festival in St Petersburg, started by Gergiev in 1993, has also put the Mariinsky on the world’s cultural map. That year, as a salute to the imperial origins of the Mariinsky, Verdi's La forza del destino, which received its premiere in Saint Petersburg in 1863, was produced with its original sets, costumes and scenery. Since then, it has become a characteristic of the White Nights Festival to present the premieres from the company’s upcoming season during this magical period, when the hours of darkness practically disappear as the summer solstice approaches. Presently, the Company lists on its roster 22 sopranos (of which Anna Netrebko may be the best known); 13 mezzo-sopranos (with Olga Borodina familiar to US and European audiences); 23 tenors; eight baritones; and 14 basses. With Gergiev in charge overall, there is a Head of Stage Administration, a Stage Director, Stage Managers and Assistants, along with 14 accompanists. In 2003, the post-modernist architect Dominique Perrault won a much-publicized contest for his design for a new home for the theater, adjacent to the current building. The historic original structure will undergo a complete renovation, expected to begin in Autumn 2006. Allison, John (ed.). Great Opera Houses of the World. Supplement to Opera Magazine, London, 2003. This page was last modified on 15 August 2018, at 15:43.